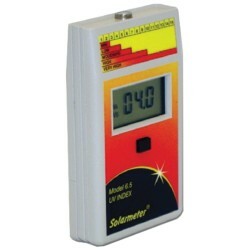 SOLARMETER® PRODUCTS There are 16 products. Radiometer UVA - A Hand Held Digital UVA Radiometer. SOLARMETER MODEL 4.0 - UVA. UVA 320-400 nm, 0-199.9 milliwatts/square cm. Primary use: Overall lamp intensity vs. aging. UVA 320-400 nm, 0-1999 microwatts/square cm. Low level UV from windows & home lamps. Total UV (A+B) 280-400 nm, 0-199.9 milliwatts/square cm. Lamp UVA intensity and acrylic transmission. Total UV (A+B) 280-400 nm, 0-1999 microwatts/square cm. Very low levels of UV + window film testing. UVB 280-320 nm, 0-19.99 milliwatts/square cm. Primary use: lamp UVB intensity and acrylic transmission. UVB 280-320 nm, 0-1999 microwatts/square cm. 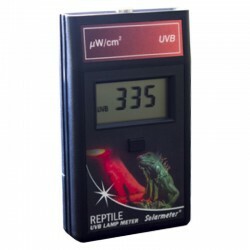 Sensitive version for outdoor UVB irradiance and reptile UVB lamps. (converted from 7-DHC) per minute of ultraviolet B exposure. 0-1999 range. A Hand Held Digital UV Radiometer with Integral Sensor. UV index outdoor solar intensity, mW/m² Eeff / 25 (or W/m² Eeff x 40). weighted irradiance on a 1-15+ scale. 0-199.9 range. Radiometer MED/HR - A Hand Held Digital UVA Radiometer. SOLARMETER MODEL 7.0 ERYTHEMALLY EFFECTIVE (Eeff) UVR. MED/hr 280-400 nm Eeff, 0-199.9 range. Minimal Erythema Dose/hr Diffey erythemally weighted irradiance. Available set to 156 J/m² per MED for US FDA guidelines, or 210 or 250 J/m² per MED for EU or AU guidelines. A Hand Held Digital UVC Radiometer with Integral Sensor. UVC 246-262 nm, 0-1999 microwatts/cm². Peak response near 254 nm. Primary use: Germicidal lamp measurement. 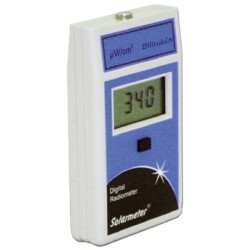 SOLARMETER 9.2 - Radiometer Bilirubin / Blue LED / lamp intensity. A Hand Held Digital Radiometer for Blue light. Bilirubin Light 422-499 nm, 0-1999 microwatts/square cm. Peak response near 450 nm. For measuring bilirubin lamp and low level blue lamps/LEDs. SOLARMETER 9.4 - Radiometer BLUE LIGHT. A Hand Held Digital Blue Light Radiometer. Visible Blue Light 422-499 nm, 0-199.9 mW/cm². Peak response near 450 nm. For measuring blue lamp and LED irradiance. SOLARMETER 9.6 - Radiometer RED LIGT. Visible Red Light 585-741 nm, 0-199.9 mW/cm². Response at 632-737 nm > 75%. For measuring red LED, Fluorescent and HP (HID) irradiance. 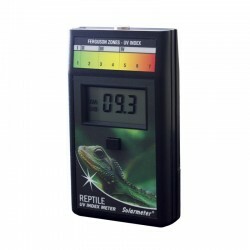 SOLARMETER 10.0 - Radiometer Photovoltaic. A Hand Held Digital PV Radiometer. Photovoltaic (PV) solar light irradiance 400-1100 nm, 0-1999 W/m². For Solar Panel sun power testing.